Everyone knows the importance of diversification. From the traditional investor abiding by the old adage of not keeping all their eggs in one basket to the more financially astute wanting to improve their Sharpe ratios, diversification is all about balancing returns with risk. Typically, when investors think of diversification, it most often relates to their exposure to equities, bonds, real estate, precious metals and cash. 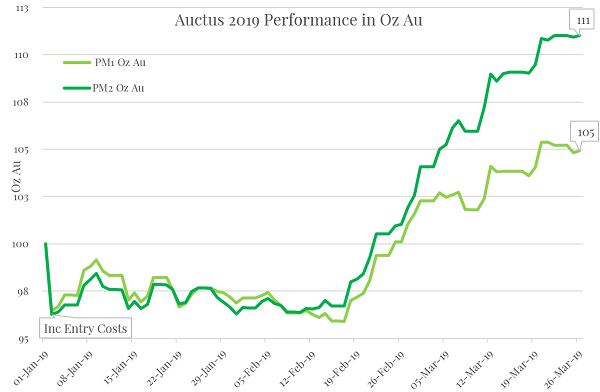 Precious metals have always been a valuable component to a diversified portfolio as they achieve better to comparable returns to the other major asset classes over the long term and usually perform counter-cyclically thus delivering the much-needed returns when other investments are going backwards. Some investors take a fairly static approach to the proportions they will hold in each asset class whilst others who are more in touch with market conditions take a more dynamic approach to adjusting their exposures based on perceived cycle timings. At the moment for example, many investors are recognising that both equities and real estate are showing signs of being in very late cycle/turning market conditions and are increasing their exposure to the safer haven asset classes accordingly. As mentioned earlier, It’s all about balancing returns with risk. A large component of precious metal investors quite rightly has serious concerns about the sustainability of current global macroeconomic conditions and the impact a breakdown in these conditions would have on equity, real estate, and FIAT currency markets. As a result, they have placed a higher weighting towards their precious metals investments to mitigate their exposure to these perceived high-risk asset classes, realising the importance of holding a physical store of wealth if these markets breakdown. A lot of these investors however have been surprised by the longevity of what has now become one of the longest equity bull runs in history. Although they believe the fundamentals that lead them to their initial concerns have worsened, they are frustrated that with 20:20 hindsight, they now question that their portfolio diversification weighting could have been better. This is where the importance of the often-overlooked diversification within the precious metals asset class should be considered. The precious metals asset class as an investment product is typically made up of Gold, Silver and the Platinum Group Metals (PGMs) of Platinum, Palladium and Rhodium. Most investors are well versed in the liquidity, price transparency and value density benefits of the Precious Metals asset class, particularly Gold and Silver. The PGM’s however typically aren’t as well known and used by the broader investment community mainly due to their much smaller market size and taxation classification in certain jurisdictions (eg Palladium and Rhodium are subject to GST in Australia). Similarly to how gold greatly benefits a broader diversified investment portfolio however, PGM’s exhibit the same benefits to a diversified precious metals portfolio, providing counter-cyclical returns when Gold and Silver are under-performing. Below is the USD price chart of Gold and the PGMs over the last 20 years. 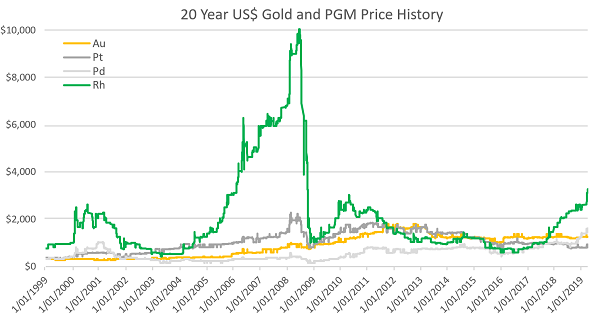 As you can see, the PGMs historically exhibit significantly more price volatility relative to Gold. Like any investment, this presents an opportunity for considerably more gains relative to gold but also considerably more risk. Both components can be managed and balanced effectively with an active portfolio diversification strategy. There are many benefits to adopting a managed precious metals diversified portfolio. Unlike equities, bonds, and FIAT currencies, holding physical precious metals provides the investor with a durable tangible asset that although may fluctuate in price will always retain some intrinsic value. Diversifying within the precious metals group allows the investor to participate in trading opportunities that present themselves whilst still always maintaining a total physical metal holding. Precious metals are all transition metals exhibiting similar chemical and physical properties, particularly the PGMs which are regularly interchangeable in end use. The PGM’s are also very closely related on the supply side with a large proportion of Palladium and Rhodium supply being a by-product of Platinum mining. These close relationships in both supply and demand create price elasticity events which present significant trading opportunities if managed effectively. The major benefit however to a diversified precious metals portfolio is its ability to turn what is usually considered a non-yielding asset into a yielding asset, joining the likes of equities, bonds, and real estate. A static holding in precious metals historically enjoys very strong long term capital value growth, but unlike equities which pay dividends or real estate which pays rental returns, doesn’t provide any yield returns. To the contrary, there are typically costs such as vaulting and/or insurance to be incurred for holding precious metals, making them effectively negative yielding. The significant capital growth more than compensates for these minor ongoing costs over the long term, but this lack of yield is sometimes a bone of contention when comparing precious metals to other major asset classes. By adopting a managed precious metals diversified portfolio, you provide the ability to increase your total physical precious metal holdings by transitioning from one metal to the other at the appropriate time. As a simple example, if you exchange 1 oz of gold to silver when the gold:silver ratio is 80:1, then eventually exchange the silver back to gold when the ratio is 40:1, you have turned your original 1 oz of gold into 2oz, effectively generating a yield on your original holding. If you apply a similar methodology across all the precious metals, the market provides opportunities for significant gains (and losses) to your original holding if managed effectively. 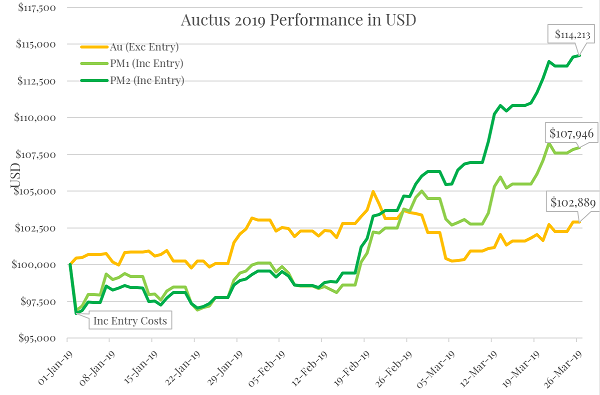 Below is an example of YTD 2019 returns of a Singapore based affiliated company called Auctus which provides a managed physical precious metal portfolio service. As you can see, when managed effectively the performance can be impressive, achieving both capital growth and increasing yields on your original holdings. Diversification is an important component of any successful investment strategy. It provides the ability to improve overall performance by balancing return potential with its associated risk. Like any successful investment strategy, when it is actively managed well by professionals with extensive awareness of the markets, the results can be quite compelling.